Looking for a new adventure in sewing? You might enjoy Bias Cut Blueprints. This book contains a method for making different garments of any size cut on the bias. 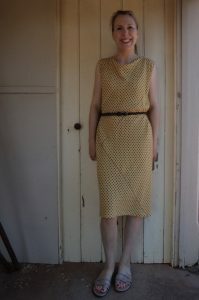 You create a bias cut tube following the book’s directions, and transform it into a dress, top or skirt. The book explains many neckline, sleeve and hemline variations. 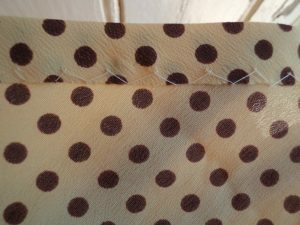 It also gives advice for finishing off bias cut edges (always tricky, in my experience). 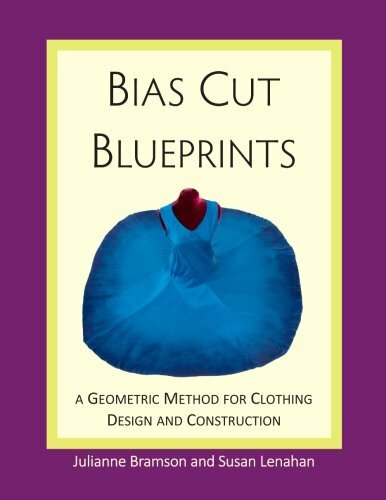 Bias Cut Blueprints begins with how the authors, Julianne Bramson and Susan Lenahan, discovered bias cut clothes and how they came to write the book. 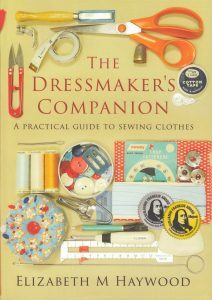 Their book explores how bias cut clothes perform the way they do, suitable fabrics and how to handle them, and an explanation on sizing and fit related to bias cut. The authors were influenced by Madeline Vionnet’s pattern cutting. You don’t have to be an advanced sewer to use this book. The book is very well thought-out, generous and easy to read. The project directions are easy to follow, in small baby steps. The diagrams are clear and the book is well illustrated (with perhaps the exception of the front cover, but overlook that). 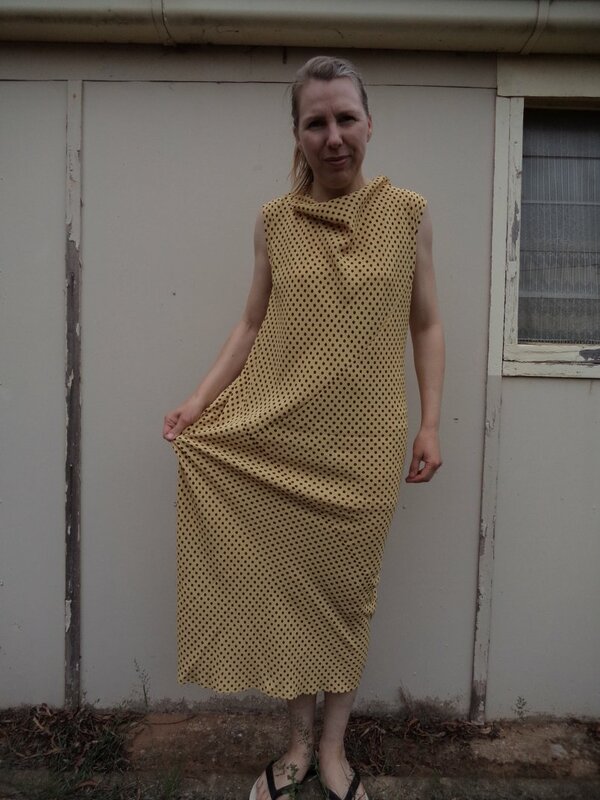 To properly review this book I made a dress from the instructions. 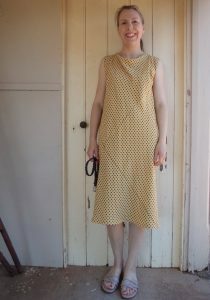 I used a very drapey 100% synthetic bought from the op shop some time ago. Polyester? The back view. The back neck is brought in with small darts, forming a cowl neck at the front. I thought I had cut my dress too big because seemed too wide on me (but I hadn’t, and it was fine). 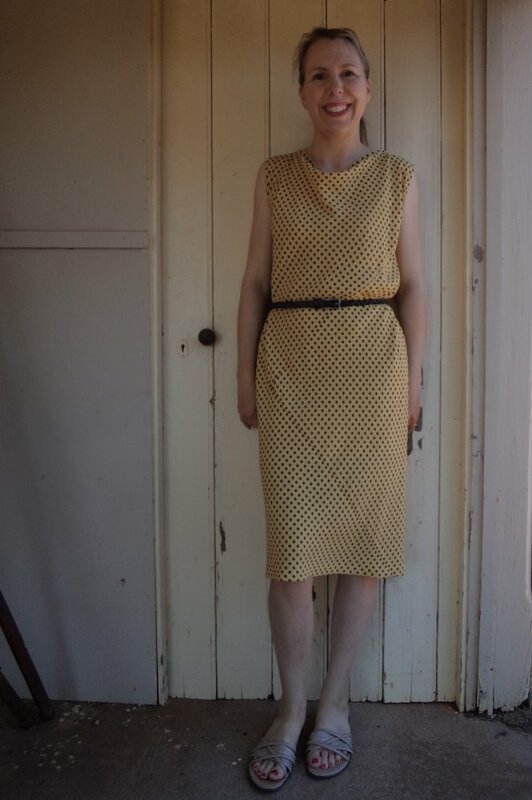 I added a narrow belt, which improved the dress. I’ll admit I’m wearing more underwear than normal, or should I say more “specific” underwear: full briefs, smoothlines bra and full slip, all in a “natural” colour. I’m wearing more underneath than on top. I wore the dress yesterday (out of the house, that is) to see what it was like. What can I say? It was so unlike anything I’ve worn. The way it fitted surprised me. It was almost like wearing a nightie, it was so free to wear. I’m not used to wearing flowing clothes (I tend to favour crisp fabrics and structured styles) but this just seemed to work in a way I hadn’t anticipated. 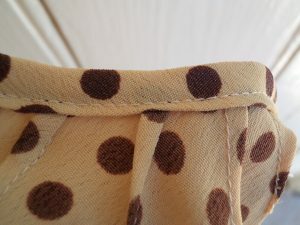 I also noticed that although the dress came to below my knee and had no split or vent, I had no problems getting in and out of the car gracefully. Lots of people said “I like your dress”. The dress was certainly very economical with fabric, because I began with a rectangle, transformed it into a bias tube following the directions, and then cut armholes, sewed shoulders and finished the neck. The instructions are very much fit-as-you-go, and make-decisions-as-you-go, which is a different way of working for me. Usually I fit, cut, sew, and perhaps check the length at the end. With this, I was sewing a section, trying it on, measuring and cutting the next bit, trying it on, and so on. Nevertheless, each step was easy and making the dress wasn’t a very long process. Bias Cut Blueprints gives several options for finishing the edges. For the armholes I made a superfine bias facing. 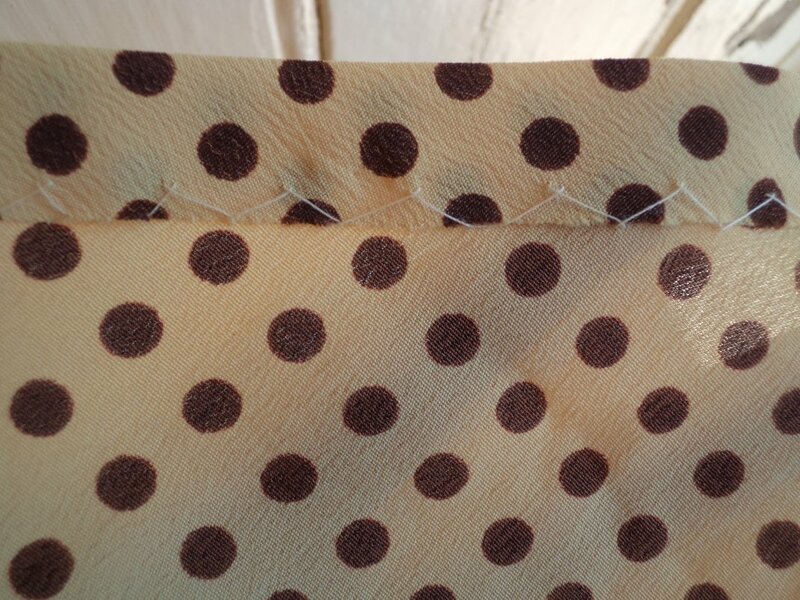 For the neckline I used a double folded bias strip as a facing. You can see the small darts for the back neck. 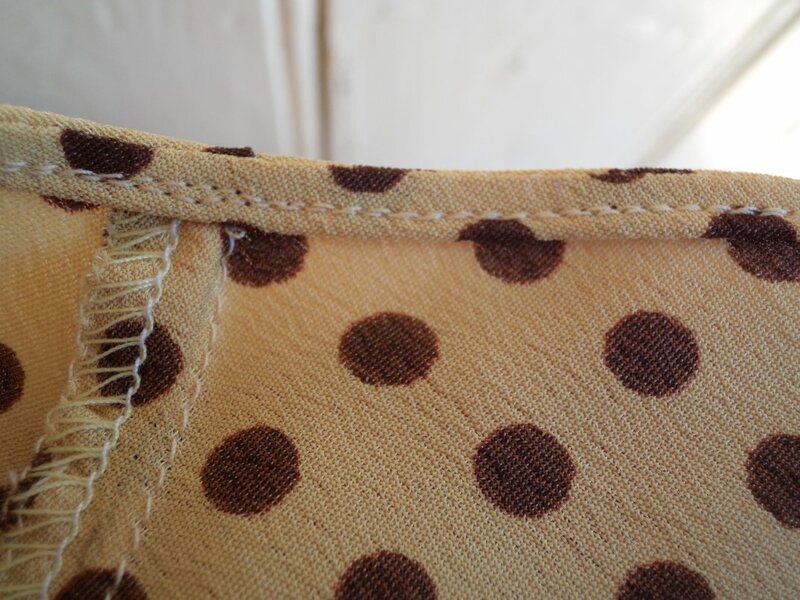 The hem is simply herringbone stitched in place, over the raw edge. You can listen to a podcast of the authors being interviewed on Threadcult in 2013 (at the time they’d written the book but not edited or published it yet). I had heard of Bias Cut Blueprints but had been umming and ahhing about buying it until I heard this interview (that’s happened with more than a few books). The author’s website is Fashion in Harmony, where there’s more on bias cut clothing, patterns and more about Bias Cut Blueprints. There’s a look inside the book here. Bias Cut Blueprints is $US50 from here, but Aussie buyers be aware: with the exchange rate and shipping it cost me $AU85 (Eeek! I thought, but it was too late by then). This is a totally independent review. Thanks Val. I think you would enjoy this book. I went down a rabbithole after bias cut information a couple of years ago, had come across this concept/dress pattern and then lost track of it – I’m so glad I found your blog! I love your review and the dress looks great on you! As an Australian, the book is outside my budget but I might have a play around with the concept of starting with a bias tube and cutting in openings (which seems very Japanese to me, very Yamamoto or Miyaki). Thanks for this great review! Thanks, Shayne. Have fun with your bias experiments!